Dan Zak’s Almighty: Courage, Resistance and Existential Peril in the Nuclear Age is a must read for everyone in this country who has forgotten about nuclear weapons. And that is most of us, isn’t it? They call themselves Transform Now Plowshares, and on July 28, 2012, the nonviolent peace activists penetrated Y-12, a heavily guarded nuclear facility tucked within the hills and valleys of Tennessee. After cutting through fences and hiking miles in the dark, they reached the outer walls of the complex’s highly enriched uranium materials facility. The HEUMF—which sounds like a noise Winnie the Pooh would make falling out of a honey tree—is the Fort Knox of fissile material, designed to store 400 metric tons of highly enriched uranium. Once there, the activists painted religious, anti-nuclear slogans on the walls of a building, laid banners on fences, and poured their own blood across the facility’s walls. They then prayed and sang until being apprehended by security. This author knows all three of the activists: Sister Megan Rice, a Catholic nun, was 82 years old then. Her companions, Michael Walli and Greg Boertje-Obed, were younger: 63 and 57. Walking through the plant, they were acting in line with a Plowshares tradition that spanned back further than 30 years. The first was in 1980, when eight people, inspired by a passage from the book of Isaiah that envisions transformation—“they shall beat their swords into plowshares, and their spears into pruning hooks; nation shall not lift up sword against nation, neither shall they learn war anymore”—broke into a General Electric plant in Pennsylvania that manufactured reentry systems for the Minuteman Missile. They hammered on nose cones, poured their blood onto the plant, and waited for security to arrest them. Afterwards, the Plowshares Eight’s statement read: “We wish also to challenge the lethal lie spun by G.E. through its motto, ‘We bring good things to life.’” As manufacturers of the Mark 12A reentry vehicle, G.E. actually prepares to bring good things to death.” My father and uncle—Phil Berrigan and Dan Berrigan—were part of that first action, and Phil went on to plan or participate in (or both) many more similar actions until his death in 2002. Since the first, nearly 100 similarly inspired actions of symbolic disarmament and token transformation have occurred in the United States and Europe, Australia and New Zealand. Most such actions, and the ensuing trials, attract little more than local attention. Transform Now Plowshares was different, garnering widespread publicity through above-the-fold coverage in The Washington Post, The New York Times, and daily local news sources, as well as through congressional hearings on security lapses in Washington. Maybe it was the age and earnestness of the activists, or maybe it was the singularity of their feat—penetrating so deeply into such a secure facility—or maybe it was the political moment. But, whatever it was, Transform Now directed attention and forced the general public to question nuclear weapons like never before. “Y-12 is a very secure facility. It is, and will always be, one of the most secure facilities in this country and in the world,” testified Ted Sherry, the senior federal manager at Y-12, at an earlier trial for peace activists. 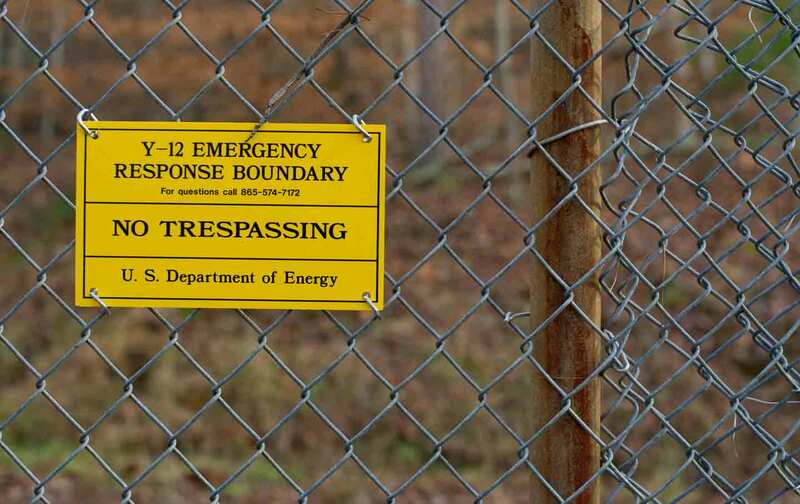 The action and the embarrassed, scrambling response from the National Nuclear Security Administration, shut down Y-12 for two weeks. It drew attention to lapses and deficiencies in security throughout the nuclear complex, which contracts with private military firms for hundreds of millions of dollars in base security. “Y-12” doesn’t stand for anything. The facility was built to enrich uranium for nuclear weapons and was a key component of the Manhattan Project. In the early 1940s, some people called it the “Mystery Plant” and others dubbed it the “Shangri-la Plant.” It was a massive undertaking. The federal government seized 60,000 acres of land, evicted 3,000 farmers and homesteaders, paved 200 miles of road and erected 44,000 houses. Once the complex was constructed, 75,000 people were brought in to operate it. High-school girls were told they’d be making ice cream and trained to turn knobs and flip switches perched in high stools. Men worked 70 hours a week, exhausted and stressed. But they didn’t talk about it. Ever. At its height, Y-12 was producing “several hundred grams of bomb-grade uranium per day” and eating up 14 percent of the nation’s electricity. Zak vividly renders how, in this strange and isolated world, people worked hard every day while having no idea what they were doing. Prospective jurors for the Transform Now Ploughshares trial all had some connection to the Y-12 facility and very little knowledge of or curiosity about what their family members did there. As Oak Ridge Mayor Tom Beehan told Zak, “If you were to walk around in here right now and start talking to people about [nuclear bombs], you’d get blank stares.” The Transform Now activists hoped to shatter this pervasive silence, but the cone of secrecy endures to this day. Since the end of the Cold War, Y-12 has morphed, however, the facility remains responsible for ensuring bomb components are ready to be deployed if needed. But, as Zak writes, “Oak Ridge’s nuclear legacy has been rebranded and diversified into a broader, vaguer mission,” which is costing taxpayers billions. It is now “Innovation Valley,” home to Titan, one of the world’s biggest and fastest supercomputers; the Everest visualization facility; the Spallation Neutron Source; and more high-tech, super sci-fi, next-edge sort of machines. Around the time of the trial, a progressive Christian student confessed to Sister Megan: “I know nothing about the anti-nuclear movement. I was born in ’92, and it’s kind of an afterthought for my generation.” Fair enough. Millennials have their hands full with catastrophic climate change, crippling debt from name-brand educations that do not guarantee living wages or secure employment, the scourge of gun violence, the threat of terrorism, the muscular militarization of everyday life including policing, just to name a few. But to the Plowshares movement, all of these issues are built on the foundation of the bomb and its unique God-defying, creation-threatening destructive power. This tunnel vision and the ardent faith of the activists makes for a peculiar disconnect with mainstream society, which was on full display at the trial and sentencing of the three activists. Erhart took issue with complacency, saying he believed “a better term would be ‘normalization of the deviation from the optimum.’” Zak writes that this turn of phrase drew scoffs from the audience and snores from the jury. Brigadier General Rodney L. Johnson was tasked with leading the “recovery” after the break in (as though Y-12 was New Orleans after Katrina or Baton Rouge after this latest round of killing rains). In his testimony he tried to explain why the defendants were being billed $8,531.67 for repairs to the HEUMF when it was also basic work like mending the fences and painting over the graffiti. The three served about two years before a Cincinnati appeals court found that the government had mistaken motive for intent and overturned their convictions. They were released. Dan Zak’s book reminds readers that the United States’ long, tangled, poisonous, and very expensive nuclear-weapons odyssey is far from over. And it will need a lot more people not forgetting if the outcome is going to be ultimately hopeful.